The solar power costs are reduced with tax credits and other benefits, making investing with Solar Advantage an easy choice. Thanks to innovations in technology and a larger understanding of environmental issues, going green is easier than ever. The solar power costs associated with installation are typically paid off quickly, making solar power a wise long-term investment. No matter what selection you make, achieving energy independence is worth the solar power costs. The IRS allows business owners to receive a tax credit equal to 30% of your solar power costs. A tax credit is better than a deduction, because if the amount is large, it can be carried forward to apply to future tax years. This credit can be applied the year prior to installation and carried forward for 20 years. Most businesses can use their section 179 depreciation or at the very least the accelerated five-year MACRS depreciation on 85% of the system value. Combined, these two benefits often equal more than half of the system cost. Property Assessed Clean Energy (PACE) is an efficient and no-money-down way to get business owners into solar power by financing the power system like a tax through the county or city office. PACE is not yet a state-wide program and is strictly based on counties and cities throughout Florida. Visit the following websites for more information and to see if your business is located in an area that has accepted PACE. 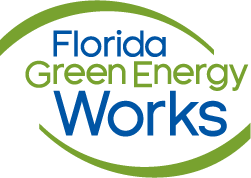 all power companies in florida are obligated to offer you net-metering when you interconnect a solar power system. Solar Advantage is a registered contractor with several commercial and residential PACE loan providers in Florida so you can enjoy zero down financing on your PV and solar roof projects.